Ako-san, Rick’s secretary, knows I love red bean paste sweets. So she is always sending me yummy treats. This morning I found these on my kitchen counter so I had one for breakfast. 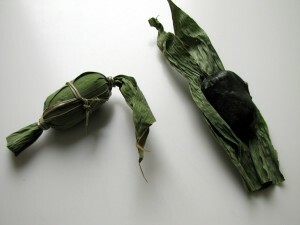 It is red bean paste wrapped in a gooey mochi like substance and then wrapped in leaves and ties with string so that they stay fresh (and look really cute). Yum!